Home » Gwitchin. Peoples of Alaska in 1850th. 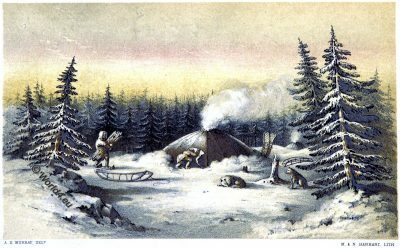 The Gwich’in or Gwitchin (formerly also called Kutchin) are an indian tribe group in the border area between Canada and Alaska and are both linguistically and culturally among the Alaska Athabasks and Northern Athabasks. 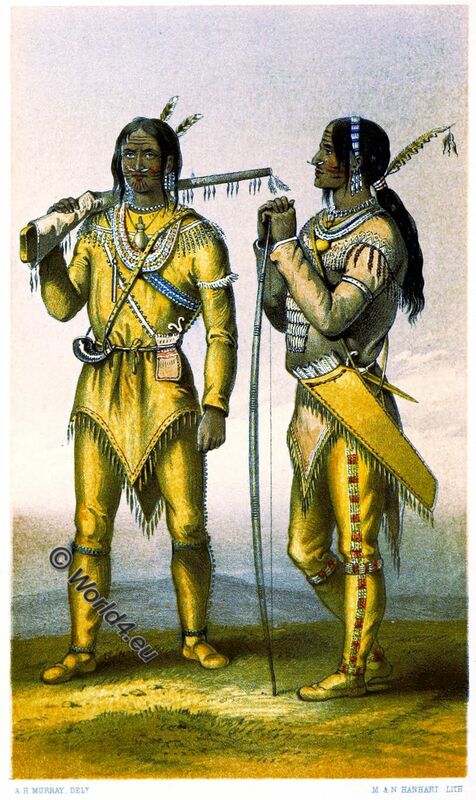 They were known as the Loucheux or the Loucheaux (French-Canadian Voyageurs), while the British called them Tukudh or Tukkuth, since the first Bible translation by Anglican missionaries in the dialect of the Dagoo Gwich’in / Dagudh Gwich’in / Tukudh Kutchin / Tukkuthkutchin / Upper Porcupine River Kutchin took place. 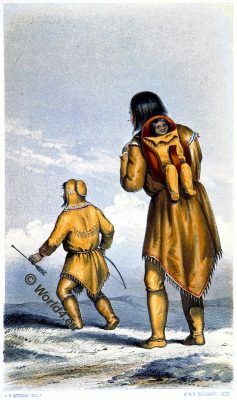 They sometimes refer to themselves as Dinjii Zhuu (“small people”), often using all the Indians to distinguish them from the often hostile Yupik and Jupupiat Eskimo – called Ch’ineekaii – as well as later by the Europeans. The Gwitchin once roamed the mountain tundra and forest tundra of Alaska and Canada in the river area of the Yukon River and its tributaries Birch Creek, Beaver Creek, Pelly River, Porcupine River and Chandalar River as well as in the river and delta of the Mackenzie River and its tributaries Arctic Red River, Peel River and Horn River. Large areas were also located north of the polar circle and therefore included the open, tree-free tundra, which was characterized by mosses and lichens. 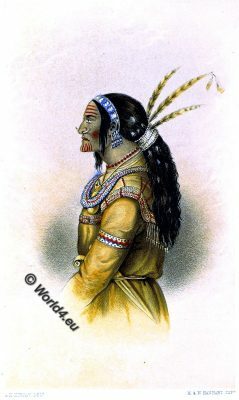 The Gwitchin therefore formed the tribe of all Indians of North America, who lived the furthest north. 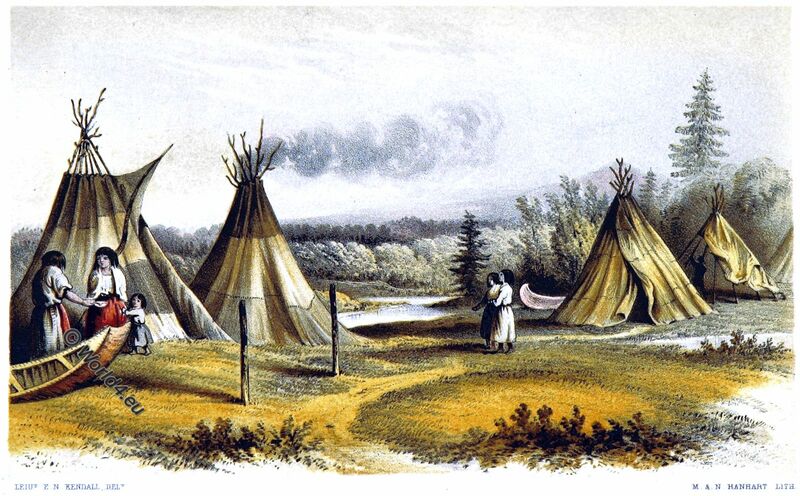 Cree wigwams in summer 1850. Numerous narratives contain fragments from the distant past of the tribes in a clawed form. They often begin with “In the old days” (Deenaadai), and continue, “when all men could speak with the animals, and all the animals could speak with men.” The spiritual world of the Gwitchin does not need a God, for all things and creatures have a spirit. The Inupiat (in Gwitchin: Ch’ineekaii) from the Kobuk River were regarded as outstanding shamans. Such Dinjii Dazhan stood in high esteem, had contact with supernatural forces could influence the behavior of prey and had healing powers and knowledge. Gwitchin (Kutchin) warrior and his Wife. All the females have their chins tattooed, and when they paint their faces they use a black pigment. 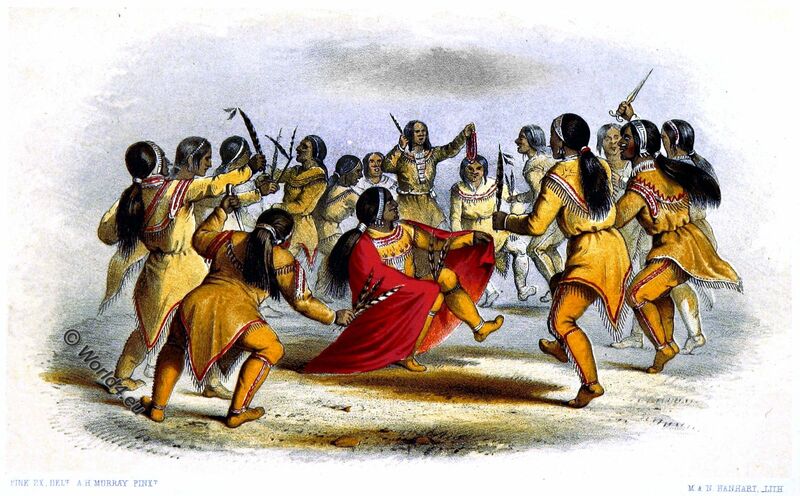 The men employ both red and black paints on all occasions of ceremony, every one applying them according to his fancy; and that they may always have them ready, each has a small bag containing red clay and black lead suspended to his neck. Most commonly the eyes are encircled with black; a stripe of the same hue is drawn down the middle of the nose; and a blotch is made on the upper part of each cheek. The forehead is crossed by many narrow red stripes, and the chin is streaked alternately with red and black. 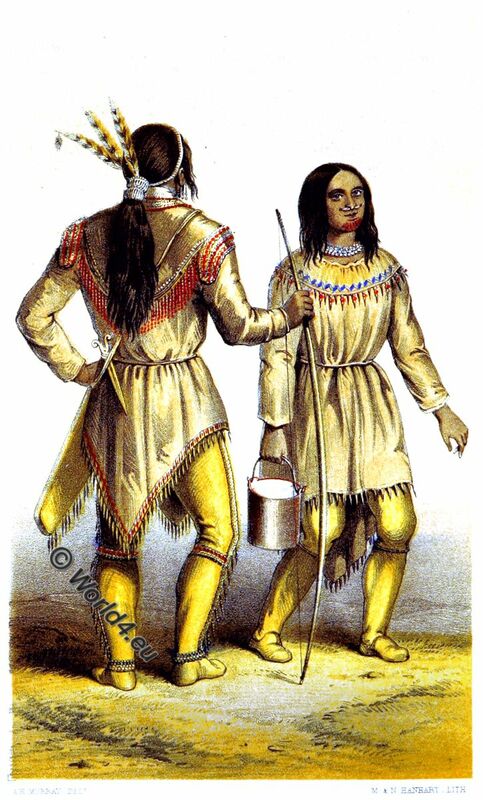 The Chipewyan and Crees paint their faces in a similar manner. The outer shirt of the Gwitchin is formed of the skins of fawn rein-deer, dressed with the hair on, after the manner of the Hare Indians, Dog-ribs, and other Chipewyan tribes, but in its form it resembles the shirts of the Eskimos, being furnished with peaked skirts, though of smaller uze. The men wear these peaks before and behind; the women have larger back skirts but none in front. 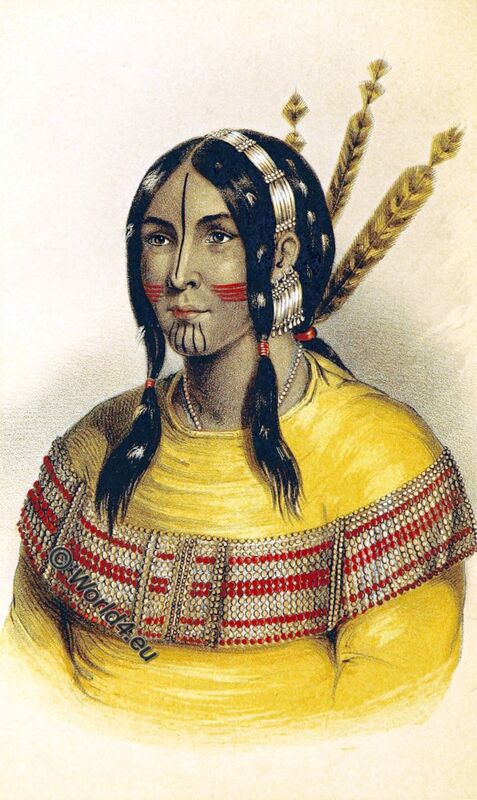 A broad band of beads is worn across the shoulders and breast of the shirt, and the hinder part of the dress is fringed with fancy beads and small leathern tassels, wound round with dyed porcupine quills, and strung with the silvery fruit of the oleaster (Silverberry or Wolf-willow, Elaeagnus commutata, Elaeagnus argentea). 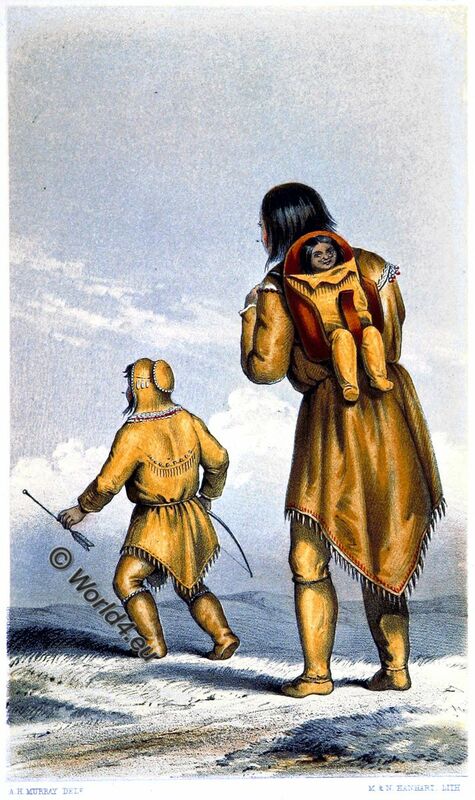 Gwitchin (Kutchin) woman and children. The inferior garment of both sexes is a pair of deerskin pantaloons, the shoes being of the same piece, or sewed to them. A stripe of beads, two inches broad, strung in alternate red and white squares, runs from the ankle to the hip along the seam of the trousers, and bands of beads encircle the ankles. The poorer sort wear only a fringe of beads, and sometimes only porcupine quills. The wealthy load themselves with beads, strung in every kind of pattern, on the breast and shoulders; and sometimes immense rolls of this valuable article are used as necklaces. Head-bands are formed of small various-colored beads, mixed with dentalium shells, and the same kind of shells are worn in the nose and ears. The hair is tied behind in a cue, bound round at the root -with a fillet of shells and beads, and loose at the end. This cue is daubed by the tribes on the Yukon with grease and the down of geese and ducks, until, by repetitions of the process continued from infancy, it swells to an enormous thickness; sometimes so that it nearly equals the neck in diameter, and the weight of the accumulated load of hair, dirt, and ornaments, causes the wearer to stoop forwards habitually. The tail feathers of the eagle and fishing-hawk are stuck into the hair on the back of the head, and are removed only when the owner retires to sleep, or when he wishes to wave them to and fro in a dance. The mittens, which the men always carry with them, are also adorned with shells, and some of these expensive appendages are even attached to their guns. The women wear fewer shells and beads, both of which have a high value in the nation, especially the shells. The shells, being several species of Dentalium and Arenicola, are collected in the Archipelago lying between the Oregon and Cape Fairweather, and pass by trade from tribe to tribe. The large-ribbed Dentalium is most prized. Dance of the Gwitchin (Kutcha-Kutchi). In winter, shirts of hare-skin are worn, and the deer-skin pantaloons have the fur next the skin. 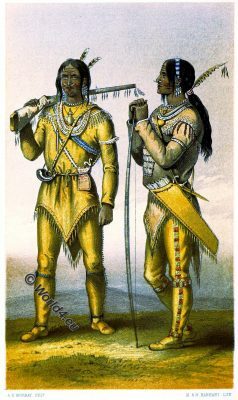 On their journeys, travelers carry with them their dress clothes, which they put on every evening after encamping, and when they come to the trading posts. None of the neighboring nations pay so much attention to personal cleanliness and appearance. The arms of the men are a bow and arrow, a knife, a dagger, and a spear, with a quiver hanging on the left side, and suspended by an embellished belt, which passes over the right shoulder. Fancy handles and fluted blades are more valued than the good temper of a knife; and this people complain of the trouble of sharpening a hard steel weapon. Guns have been lately introduced among the Gwitchin, and are in great demand. All the men carry powder and ball, whether they own a gun or not, and for it obtain a share of the game killed by the possessors of fire-arms. Source: Arctic searching expedition: a journal of a boat-voyage through Rupert’s Land and the Arctic Sea, in search of the discovery ships under command of Sir John Franklin. With an appendix on the physical geography of North America. By Sir John Richardson. London 1851.